“Flora 717 is a sanitation worker, a member of the lowest caste in her orchard hive where work and sacrifice are the highest virtues and worship of the beloved Queen the only religion. But Flora is not like other bees. With circumstances threatening the hive’s survival, her curiosity is regarded as a dangerous flaw but her courage and strength are an asset. She is allowed to feed the newborns in the royal nursery and then to become a forager, flying alone and free to collect pollen. She also finds her way into the Queen’s inner sanctum, where she discovers mysteries about the hive that are both profound and ominous. But when Flora breaks the most sacred law of all—daring to challenge the Queen’s fertility—enemies abound, from the fearsome fertility police who enforce the strict social hierarchy to the high priestesses jealously wedded to power. Her deepest instincts to serve and sacrifice are now overshadowed by an even deeper desire, a fierce maternal love that will bring her into conflict with her conscience, her heart, her society—and lead her to unthinkable deeds. 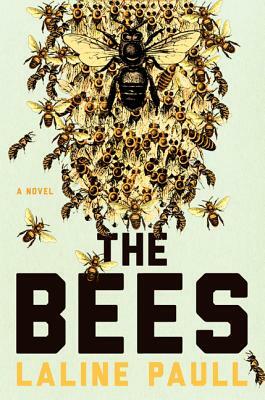 The Bees is quite the impressive debut novel from Laline Paull. And yes, it is entirely about bees, narrated by bees and the hierarchy of the hive. These anthropomorphic bees “Accept, Obey, Serve” their Queen and are dutiful and diligent in their position within the hive. Flora is unlike most sanitation workers, the lowest position within the hive, because she can talk, she has thoughts and opinions of her own, she is strong, resilient, able to fight off enemies, produce flow for infants, and the list goes on and on. So when her “deformity” is considered a threat and is about to be killed by two officers, priestess Sister Sage intervenes, decides to spare her and experiment a little to see what she is capable of. And let the games begin! Some readers compared this novel to The Hunger Games (with bees), The Handmaid’s Tale (with bees), Animal Farm (with bees) or even Watership Down (yes, with bees). But I have only read The Hunger Games and Animal Farm and do see some slight similarities but not much. It was so utterly consuming with the lifestyle and hierarchy of the bees that some of the descriptions and terminology were lost on me, not having much of a background on the insect. There was also no reference to a time period but while reading it, some of the language felt like the Victorian Age with all the curtsying, bowing and entertaining of the Drones. Tags: anthropomorphism, bees, debut novels, Dystopian, fantasy, Laline Paull, Science Fiction. Bookmark the permalink. I actually have a copy of this at home but I haven’t been able to read it yet. Did you find it to be a fast read? Not necessarily a “fast” read but engaging all the same. I’ve been super busy with work and kids activities this summer that I am finding less time to sit down and devour a book so my reading is taking longer these days.